Image courtesy of Soon to be a collector's item. Soon to be a collector’s item. It’s a tough time out there for weekly magazines as they try to compete with the 24-hour news cycle and the wealth of content available for free online. 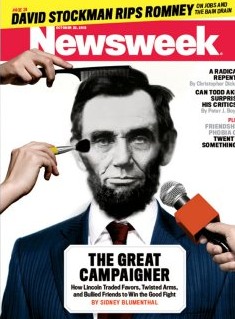 Thus, the folks at Newsweek will soon be switching to a digital-only, paid subscription service. For people who don’t want to pay, there will be a smattering of free content posted on the Daily Beast site. Print publishing has taken a huge hit in recent years as readership declined and advertising revenue followed. Meanwhile, the costs of printing and shipping physical copies of a magazine have also increased. Of course, with fewer people involved in the actual production of Newsweek — and presumably at least a short-term dip in revenue — there will be staff cuts following the switch to the digital-only format. Obviously, publishers around the world will be looking to Newsweek’s success or failure as they all consider ways to trim printing and shipping costs without damaging their readership.